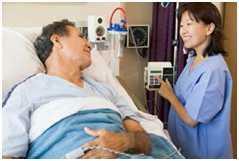 NewTech Systems Inc. has been providing solutions to hospitals for many years. Today, we continue our dedication and commitment to ensuring our healthcare clients achieve the results necessary to meet and exceed the expectations of their customers. The solutions NewTech has chosen for healthcare facilities represent the highest quality, reliability, and flexibility. From the OR to the ED, Cath Labs to Radiology, inpatient units or outpatient care areas, Newtech creates a communication synergy. Each and every staff member seamlessly communicates within the facility, reaching critical team members, retrieving important data, talking with their patients directly, all to insure their patients experience great care, comfort, and hope. Clear Audio: Intelligible communications can foster safety, quality care and greater patient satisfaction. Busy Nurse Unit: Wireless devices provide mobility, efficiency, and quick response. Workload: IV pump/aux jack provide effective care with decreased noise and exact location. Real Time Location(RTLS): High level of efficiency when integrated to Telligence. Provides accurate rounding reports and reduces manual data entry. Accurate time stamp of “Who, When, What Room, and How Long”. Let’s take a look at the ED. As the first place many patients go, it is very important that staff have tools to expedite requests for help, communicate with multiple departments, and create a professional, caring experience. It is this experience that will set the stage for the rest of their care, whether discharged or admitted. NewTech has the solutions necessary; wireless telephones, responsive call systems, monitoring patient flow in real time, and when required; delivering emergency notifications to the right people at the right time. On the floor, patients have direct access to those responsible for their stay or visit. Whether in pain, or simply in need of comfort due to being in a new environment, NewTech Mobility and Patient to Nurse Call Systems will help. Safety: Alarm prioritization gives proper notification prompting appropriate response. Telligence is fully supervised so staff knows that everything is working properly. Call escalation assures a response through phone interface. Compliance: PC reporting provides data that can be used for process improvement. Hospital Acquired Infections: Telligence provides a clean mode for appropriate disinfection without mistaken calls being placed. Bathroom stations have nylon pull cords that can be cleaned. With RTLS Hand hygiene can be monitored. Patient Satisfaction: Telligence provides station configurability to provide the correct response for each patient. It can work with complementary devices or interface with other programs to increase the number of possible solutions for documented quick response. Your hospital is continually tasked with meeting and exceeding expectations of patients and family. NewTech can help ease the pressure through extensive reporting analytics designed to validate the quality work your care teams deliver day in and day out. “Who was in to see my father today?” and “How often did they check up on my mother?” are common questions in hospitals today and NewTech Systems can deliver fast, accurate data providing confidence and security to assure your community is receiving the highest quality of care. Newtech has developed a reputation as a “one-stop” solution by delivering cost-effective access management solutions to our hospital customers. Our hardware line includes a wide range of system control processors, peripherals, readers and cards. Our Access It!® line of access control software is the most advanced and easy-to-use in the industry, ranging from “Access It!® Lite”, an entry-level, single-user version to “Access It!® Universal”, a powerful yet cost-effective and scalable system that is ideal for applications ranging from small systems to enterprise class operations.